I can clearly remember the first time I was called into the principal’s office, not as a student, but as a teacher. Okay, I’d probably been there many times before that for various reasons, but this was the first time the conversations was taking a direction I wasn’t too thrilled with. It was somewhere around October of my first year of teaching, and apparently I hadn’t been doing the best job of keeping my class in line. I guess I knew I was struggling, but hearing it from the principal was still no fun. If I’m remembering correctly, I barely held it together until I made it to my car and the tears started falling. Since then I have had many conversations with administration – some that consisted of kudos and congratulations – and others that featured a critique of the amount of homework I gave, my grading methods, or how I’d handled a particular situation. But here’s the thing about those not-so-wonderful conversations. They result in the most growth. We teachers love to hear about how great of a job we’re doing or how wonderful our newest idea is. And it’s great when we get those kudos. But it’s the tough, constructive-criticism conversations that really catapult us to the next level of excellence. If, that is, we accept them with the right attitude. Too often we do just the opposite. We decide that our classroom is our domain, and we know what is best. So we allow our feelings to get hurt. We get defensive. We dig in our heals. And we refuse to grow. Now, yes, I know that sometimes administrators make bad suggestions and sometimes they really don’t know what they’re talking about. But often they do have wisdom and advice that can make us better – even if the idea sounds horrible at first. So the next time you’re faced with some constructive criticism, try to keep a few things in mind. When You’re Facing Constructive Criticism…. Be humble. Nothing will stop our growth faster than our own pride. Yes, it hurts to be told that we may need to change something or that we’re falling short in some area or another. But as much as we want to get defensive, we really need to be humble. To stop and really listen to what our administrator is saying. To be open to new ideas. And to realize that no matter how long we’ve been teaching and how many students and parents say that we are awesome, we can always be better. Realize there may be a better way than what you’re currently doing. Often when I’ve had these conversations with administration, it’s not that my way was necessarily wrong – there was just a better way. When I stopped trying to defend my way and started really listening and looking for the better way, I realized that I was actually glad we’d had this conversation. No, it wasn’t the funnest, but looking back now I can see that my classroom was better because of them. Have an open-minded dialogue. We all know that administrators are not infallible. Sometimes their ideas aren’t the best and sometimes they don’t really understand what’s going on in your classroom. But once again – the answer is not to get defensive and to shut out their suggestions. Instead, have an open-minded dialogue. Explain your point of view, but be genuinely open to new ideas and a new plan that you can develop together. Be excited about the growth process. We all (I hope) want to grow and be better teachers. But we need to embrace the fact that growth is often a bit painful. It can be tough to change lesson plans, teaching styles, or discipline methods. And it’s no fun to get a less-than-favorable evaluation or to hear all the ways you’re not doing a good job. But the sooner we embrace the growth process, the happier we will be and the faster we will grow. So the next time a growth opportunity (i.e. some negative feedback) comes along, recognize it for the growth opportunity that it is and do exactly the opposite of what you feel like – embrace it wholeheartedly. 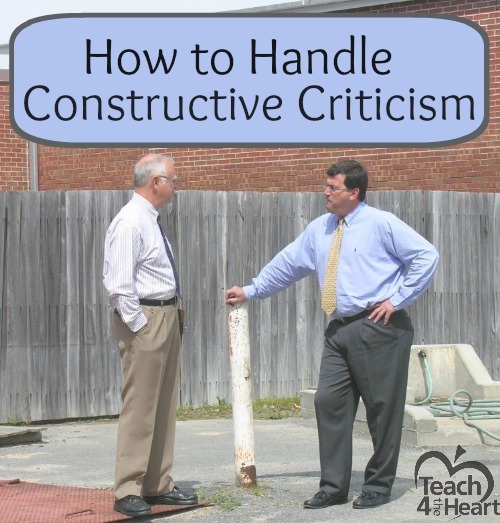 How have you typically handle constructive criticism? What piece of constructive criticism has most helped you grow? This didn’t really explain how to grow from constructive criticism. It just says to do it. If you are not certain how to attain the perspective or objective, you can ask your administrator to teach a lesson. This way one of you or both of you may learn something. (step 1.) recommend another teacher to teach a lesson while you observe. (step 2 & 3) Then, be sure to take notes, ask that teacher questions, and then (Step 4)follow up with that administrator and let them know what you’ve done to “grow/learn” to handle the objective better. (Step 5:) if the administrator is unwilling to do a demo lesson, ask them or a mentor teacher of their choice role play a lesson or situation with you and then BOTH of you give feedback to each other. Remember, its the education of the child that is paramount, not your own ego. Noone starts out knowing how to teach from the get-go. Its a learning process for all involved. Sometimes the child is the learner, sometimes THEY are the teacher. Most days, I am amazed at all that I have learned from the students/ teachers I work with. Sometimes its not all positive things either. A good habit is to have reflection time with a mentor and yourself on what went well that day, what did not, then how can you improve, or remember and reuse the awesome things you have seen or done. The article suggested that you grow by being open-minded. Years of teaching does not correlate to being the “know it all”! Education, just like everything else is evolving and we as educators must also evolve or get left behind!